A neoclassical masterpiece. Singer, guitaist and composer Kelly Simonz lives in Japan where he has released two very successful albums of which this is the second. Sign of the Times is a celebratin of melodic neoclassical hard rock. This band is not to be mistaken for the short lived supergroup of Eric Clapton, Steve Winwood and Ginger Baker back in 1969. The Blind Faith I am listening to right now are the project of Japanese guitar virtuoso Kelly Simonz (I wonder what his real name is...). Band is a vast term, as Mr Simonz more or less played all the instruments himself, and is also responsible for the vocals. As this is mostly a guitar album, it shouldn't come as a surprise that the sound is very 80ies like, reminding me a lot of Yngwie Malmsteen's better times. Especially the vocals are rather excellent, if you are into the more high pitched ranges. Respect to Kelly Simonz for this, as most of the time good guitar players turn out to be really bad vocalists and are therefore always in need of singers. Not so Kelly Simonz. Of course there are also a lot of instrumentals, some regular heavy metal guitar solo songs (you know the type), but also some different stuff: on Desperado, Kelly Simonz is showcasing his skill on Spanish guitar, and Partita BWV826 is a classical guitar piece. Blind Faith seem to like classical music quite a lot, as the solos are reminiscent of Mozart playfulness. What I don't like so much on this album are the lyrics that come in a very helpless English. It is pretty obvious that originally they were written in the Japanese language and later translated for the international market. Sad, because music is international, and it probably would have sounded more original in Japanese. But then we all know how close-minded a lot of people can be when it comes to languages they don't understand. The Rule Of Right comes in the European release with three instrumental bonus tracks. Fans of guitar music really should check this one out, because the added vocals make it more interesting than the majority of instrumental-only guitar albums. For anyone not familiar with the name (and let’s face it, why should you be), Kelly Simonz is a graduate of the prestigious GIT in Los Angeles. Born in Osaka, Japan (like you’d have guessed from the name), he has to my knowledge released two albums to date – ‘Sign Of The Times’ in 98, and ‘Silent Scream’ the following year – both of which have been recently reissued here in Europe by Lion Music. However, if you’re sat there thinking ‘Oh my god, not another Mike Varney protégé peddling interminable bloody arpeggio’s, etc. etc.’, you couldn’t be further from the truth. Heavily influenced by fellow countrymen Akira Takasaki (Loudness), and a certain Yngwie Malmsteen, Simonz’s first two releases offered up some of the finest neo-classical metal (much of it with vocals) that you’re ever likely to hear. As a technician, Simonz really does rank with the best the genre has to offer, his heavily classically influenced licks and lightning fast runs the equal of anything his peers have produced. What makes him so special however is that he also has a natural songwriting ability, an ability that enables him to pen some of the catchiest hooks and melodies the scene has seen in a long time. From the punchy, baroque speed metal of tracks like ‘Now Your Turn’, ‘Destiny’, or ‘The Rule Of Right’, to the slower, more atmospheric feel of ‘Till The End Of Time’, or the flamenco licks of instrumental ‘Desperado’, this is a high class, high impact album which has something to offer almost everyone. Remember the name because this guy is just way to good to be ignored. Reviewed by Toby on December 10, 2002. In melodic hard rock history we’ve seen bands like Rainbow, Malmsteens Rising Force and later on Axel Rudy Pell who where famous because their neoclassical influences. Blind Faith is a band formed around a gifted guitarist Kelly Simonz. He started playing the guitar at the age of 14. At his 15th year he already showcased his ability’s in a band where he played covers from Yngwie Malmsteen and Akira Takasaki. A little while later he was a support act of the eighties Japanese hero’s Loudness. At the age of 18 he started song writing because he want to be a famous rockstar. It wasn’t easy to achieve his goal. In the year 1994 his brother died so he decided to start a solo career. After releasing his "Sign of Times" album in Japan he went famous in the country of the rising sun. In the early summer of 2000 he formed a new band "Blind Faith" and released his album "The Rule of Right". On this album are a few tracks from his earlier work. Those tracks "Still" and "King Of The Castle" were rearranged for this album. This album contains a lot of high standard melodic hard rock tracks but it is not exactly similar to Yngwie’s or Rainbow’s work. Occasionally it sounds more powerful and speedy. My favourite track is one of those speedy ones "King Of The Castle" Which reminds me to Iced Earth. Nevertheless you can’t deny, Kelly Simonz has the same ambiance and musical arrangements in comparison with Rainbow & Malmseen. It’s evident that some pieces of the album have some real medieval classical elements, I refer to Blackmore’s Night. Listening to "Till The End Of Time" you felt the sensitive spheres of this composition, due to the quality of Kelly’s vocals and amazing sense to play the guitar. "Still" reminds me to the early days of Simon & Garfuncle, for now I can conclude, he managed to combine a lot of styles without losing their reliability.Partitia BWV 826 could be one of Mercyfull Fate’s Masterpieces cause he also didn’t avoid the classical and a bit doomy aspects of music. The original CD ends with an Piece of sorrow on the piano but bonustrack "Dancing On The Edge" sends the sorrow away and replaced the whole bunch with an instrumental translation of howling fury like hundred mad horses going wild. "Etude" is a Tristitia kind of arrangement on the piano that ends the album with grace. There are a few things I like to mention. The production of this album is very good. For those who like true guitar violence with some classical movements performing sweetness and bitterness in a more metal way. Go for this complete package of virtuoso. Kelly Simonz is the newest signing of one of the best labels at the moment, Lion Music.I already had the Japanese version of this album in my collection, because it was already released in Japan a couple of years ago.Now it is finally released in Europe and I think this is by far the best release of Lion Music in their history and it’s also one of the best releases of the last couple of months in the melodic hardrock genre.On this cd are 5 instrumental songs and 7 songs with vocals (including two versions of “Blind Faith” -one studio and one live version).Kelly Simonz is a pure genius because he did everything on this cd! He wrote all the songs, sang them, played all the instruments and produced and mixed the whole thing.I think every melodic hardrock fan will love this because on this cd neo-classical, melodic rock and AOR influences are combined in a perfect way!First of all Kelly is a fantastic vocalist and he mostly reminds me of J.L.Turner and Gary Hughes (Ten).As a guitarist Kelly is definitely in the same league as Yngwie Malmsteen or/and Patrick Rondat.Together with these two maestro’s he can perfectly mix beautiful melodies with speed and play it crystal clear.As a keyboardplayer Kelly is also perfect skilled and I think he can play this instrument just like Jens Johansson or Vitalij Kuprij can do.It’s not easy to name favorite songs because they are all massive, but opener “Eternal Flame” is definitely a perfect example how to play a neo-classical hard rock song! Other favorites are “King Of The Castle”, “Serpent In A Paradise” (pure Malmsteen era “Trilogy”/Odyssey”), “Blind Faith” (the most progressive song of this cd- what a chorus! ).From the instrumental ones “Sign Of The Times” is my absolute favorite and I think this is the best instrumental song ever.Just listen to the sheer brilliance of this piece of music, truly breathtaking.This song is worth buying this cd on its own.Fans of super ballads should listen to “Stay In My Heart” because this song definitely shows how good this guy can sing.If you are a fan of bands like Yngwie Malmsteen, Rainbow,At Vance or Brazen Abbot or a melodic hardrock fan in general than this cd perfectly fits in your collection and I think this cd will become one of the alltime classics! years ago, and is now re-released by the Finnish label Lion Music. keyboard playing is close to this. This is a once again a really interesting release from Lion Music. Kelly Simonz is a guitar and studio virtuoso from Osaka Japan. Despite all the misgivings about his undoubted Yngwie Malmsteen influence, there are other elements which are influential, perhaps names like Vicious Rumors or Symphony X spring to mind - combining together for a complete neo classical/hard rock experience. Now, ordinarily I'd dismiss albums like this straight away - as past 'widdly diddly' efforts from some of Kelly's contemporaries have left me somewhat cold. Only guys like Tony MacAlpine and Greg Howe have done anything remotely interesting to my ears. However, upon slapping this album into the 'melo-deck' CD player, I was convinced enough to play this right the way through. The first thing that struck me was Kelly's inate sense of 'feel', which is a term few modern guitarists know about, let alone 'felt'. There are some soaring solos amongst the hard rock bludgeon. The entire production undertaken by Kelly is excellent. A fair bit of attention has been placed on these tracks with the songs being a mix of instrumentals and vocal driven pieces. The latter veers close to the 'Odyssey' era of Malmsteen, as they are rich with emphasis on huge choruses and killer solos. Admittedly, the classical styles permeate throughout, but unlike other efforts, they do not hinder the music. A sombre church organ precedes 'Eternal Flame', followed by supersonic drums, harpischord flurries and a Malmsteen like solo. It was like being transported back to 1988 listening to 'Odyssey'. next track 'Still', is a commercial sounding effort, touched on by some ambient piano lines. 'King Of The Castle' returns to the top-heavy riff-fest, mixing grandiose passages with guitar fury. 'Blind Faith' has some grunge type riffing going on, but features two tempo changes mid song: firstly to a 1800's classical accompaniment, then secondly to a Malmsteen type solo yet again, before returning to the riff-laden theme of the song. it's clever, and different. 'Sign Of The Times' is a pure neo classical/HM workout, while my two favorite songs would be the impassioned instrumental 'Cry For You' and the awesome 'Stay In My Heart' - which is a gorgeous melodic rock workout with subtle vocals, strong guitars and lovely accompanying keys. On the quieter side: 'Solitude' showcases Kelly's impressive acoustic style, as does the workout on 'Suite In B Minor BWV 1067'. The strangely named 'Pain' is anything but. A sweet flamenco piece you'd normally expect someone like Rik Emmett to play. Certainly a turn-up for the books, and considering we've moved on a decade or two since the likes of Akira Takasaki and Kyoji Yamamoto were doing the rounds with their respective outfits, you can pencil the name of Kelly Simonz as a Japanese guitar-slinger to watch out for in the future. HAIL Japan!! Another great export coming from the land of the midnight sun. Kelly Simonz unleashes a fury of neo-classically influenced songs, hard-edged rockers and some beautiful ballads. Simonz, an ultra talented musician, handles all instruments and vocals on this release. His voice is smooth and polished and aptly suited to his musical vision. Heavily influenced by players like YJM and fellow countrymen Akira Takasaki and Norifumi Shima. Simonz combines the best of neo-classical guitar\styling with great melodic melodies and catchy song structures. Kelly has a blazing guitar technique that will be sure to please the neo-classical crowd. Simons is equally comfortable ripping off over the top arpeggios on guitar and keyboard. One of his greatest strengths lies in his awesome keyboard playing that accompanies many of the tunes on this CD. At times his keyboard / guitar interplay reminds me of Tony MacAlpine. There are numerous moments of greatness throughout this CD: The CD opens with some nice textural keyboard playing before it jumps in with the fast paced hard rocker “Eternal Flame”. 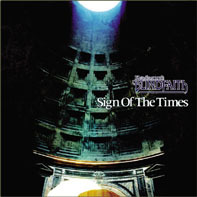 The title track “Sign of the Times” is a neo-classical storm bringer with awesome classical influences and superb keyboard / guitar exchanges. Serpent in Pain also makes great use of the Neo-classical format with a galloping rhythm and great soloing.Solitude is a day dreamy classical ballad with superb acoustic guitar. Cry for you is also a ballad with some very heart felt, emotional playing, once again featuring Kelly’s guitar and keyboard talents.There are several other cuts on Sign of the Times that contribute to its overall greatness. Not since YJM’s “Trilogy” have I enjoyed such a masterfully put together musical statement. Kelly Simon’z might just have put out the “Best CD” of 2002!! Ultra melodic power/hard rock band! Kelly is a really talented musician and he prooves it again with this release. Some songs are total power metal with the typical vocals and some others are more hard rock type and with a couple of ballads and instrumental tunes. One of the best thing on this cd is the keyboard/piano that are really 'on the front' and that sounds goods. Well written and well produced, this album will definitly please to the fans. This guy deserve to be known better here in North America. Forget about the artwork for that CD, the cover doesn't reflect what's inside!!! A great effort! Fans von YNGWIE MALMSTEEN werden ihre helle Freude an der Gitarrenarbeit des japanischen Axeman KELLY SIMONZ haben, der sich auf diesem zackigen Album im neoklassischen Stil für sämtliche Instrumente und Vocals selbst verantwortlich zeigt! Man merkt ihm zwar einen leichten Akzent an, der stört aber nicht mehr oder weniger als bei jeder anderen beliebigen anderen Band, deren Muttersprache nicht Englisch ist. Im Gegensatz zu seinem schwedischen Flitzefinger-Kollegen MALMSTEEN stehen bei SIMONZ immer die Songs an erster Stelle, so dass auch der Melodic Rock-Normalfan trotz fünf Instrumentals (unter 12 Songs) seinen Gefallen an "Sign Of The Time" findet. Anspieltipps: die tolle Ballade "Still" und der instrumentale Titeltrack. Fans of YNGWIE MALMSTEEN will dig this Japanese guitarist's album for sure - "Sign Of The Times" is a truly great piece of classical melodic hard rock! Mr. Simonz handles all vocals parts and also instruments himself! One will recognoze a bit of an accent in his singing but that's not letting down the great impression I have on this album. Most tracks are really song-orientated and the melodies and hooks will really suit stricly melodic rock lovers. Even the 5 instrumentals beneath the 12 songs are really catchy. Hot tips: the amazing ballad "Still" and the instrumental title track. are the song -Still-. Sounds a lot like the great band UK, and I loved them, so I love this song!